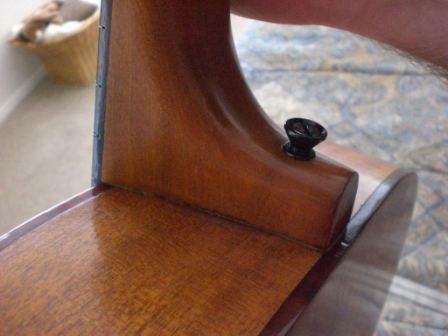 Unusual disclaimer : most luthiers would agree, we're talking about a structural modification below. 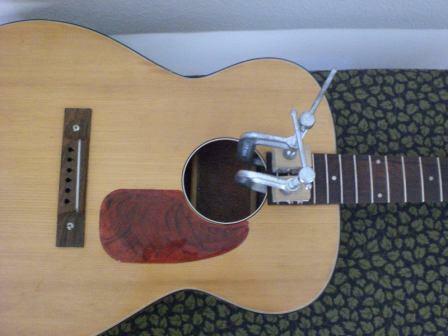 Modifications are great for your guitar, but to avoid if you plan to sell. Originality is your best friend for value. Kev : Ok, here we are. The idea comes from a lot of places. 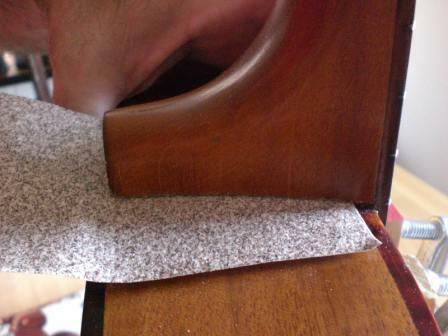 From us talking about softwood neck blocks, glue that doesnt hold, running bolts through the heel, etc. From frets.com where there's an article called 'impossable neck reset'. From Lawmans repair guy telling me about something called a 'New York reset'. 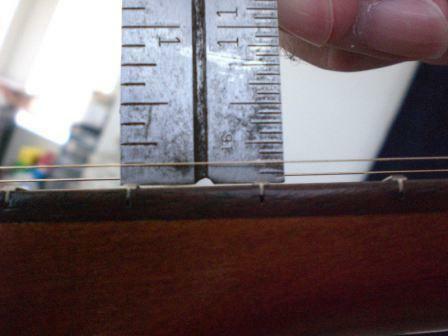 Also a comment here from Norm where he says harmony necks won't have good intonation if the strings are too low cuz they set them with high action at the factory so they wouldnt buzz, and consequently the bridges are too far back anyway. The idea was to do this with minimal expense, time, expertise, and with household tools. In other words, something almost anyone can do. It was done in an afternoon. I'll bet someone could knock one out in a couple hours after doing a few ? Counting the saw I bought, I had under 20 bucks into this (not counting the guitar of course..that was a 75 buck BIN) . 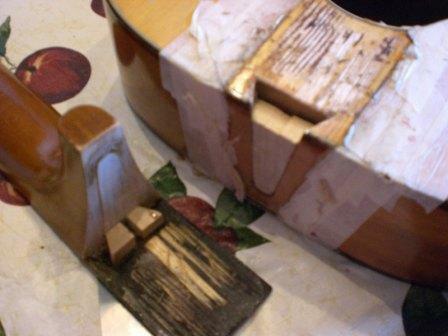 So what I did with was heat the fretboard extention to loosen, then sawed up through the neck heel to remove the neck. BTW, thats my wifes hand in the pic...I dont wear nail polish!! lol!! I marked with pencil on the sides of the neck and heel so I had a guideline when I put it back together. next: diggin' in. ya have to get it hot, use lemon oil to keep it wet, and take your time. 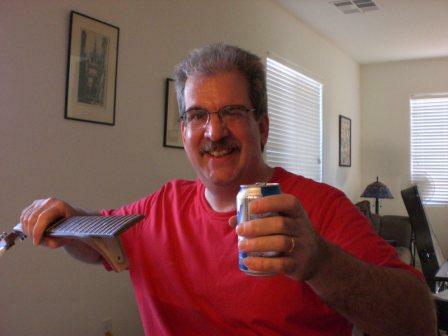 I have a Stew-mac knife, but a sharp, thin paint scaper would do it too I bet. A couple pieces of dove tail split off, had to glue 'em back in place. No biggie. Ok, we're lacking in pics here, cuz we needed two pairs of hands. I had a strap button, a 3 inch bolt, a washer, a lock washer, and a nut. What we had to do was put glue on the fertboard extension, line it up, put in together, tighten the nut inside, and then clamp the extension. In one motion. We made a couple dry runs to practice and then went for it. Some liquid courage to steady me hands!!lol!! Nice action at 1/8. There was a lot of saddle left on this guitar this so we have a nice break angle too, without screwing around with the saddle. It's strung with martin 8/20 bronze 11's. The first set I had on it were 12's just for the heck of it and worked great and played AT 1/8 too..the 11's were personal preference. Shows no sign of coming apart, moving, whatever, solid as a rock so far. Plus if ever needed you can reset it again with relative ease. Sounds real nice too. Auger : after doing a couple with various degrees of failure, and saving one by drilling the block and bolting the neck back on, I'd say you're on to something there Kevin, I think this is a very acceptable way of resetting the necks on these low end guitars. Kev : Thanks & agreed, Pete. 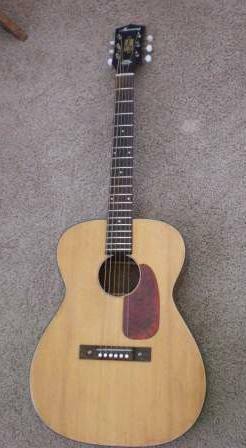 It's a better alternative than having a aged solid wood guitar be a wall hanger or thrown in the junk cuz it plays like ka-ka! A note here... 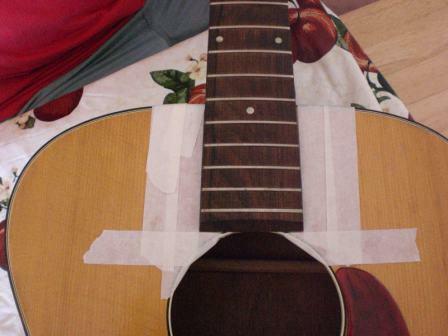 I did have to dress the frets on the upper neck to correct some very minor fret rattle, but it was a real minor operation. That was done in the same afternoon. All in all, took about 4 hours, and that was with me fumbling around cuz I've never done this before. 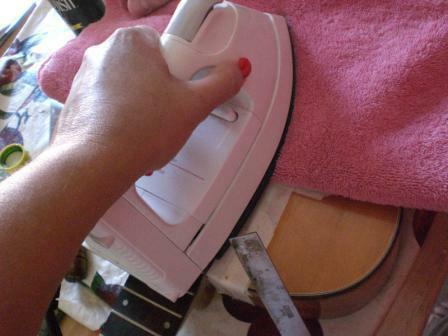 1) Did your wife do this ironing part for you 'cause she doesn't let you touch her tools ? 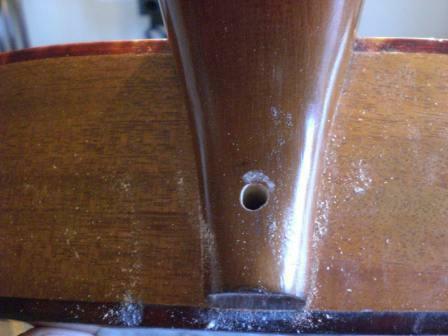 2) Probably a stupid question, but why does the fretboard extension have to be glued down in this kind of bolt-on repair ? fanfab4 : Kevin nice job and an alternative for neck resetting . Even a guy like me could give this a try . 2) because it was glued down in the first place so there must be a reason for that . 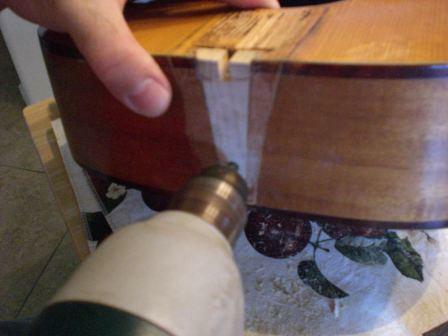 Zhyla : I believe fingerboard extensions are glued down to prevent buzzing. That's my pet theory at least. 2nd question...yeah, ya have to glue it down, spring up like a diving board otherwise. lol ! Hey Zhyla, naw... 'not quite an operation' at all. Pretty simple & straightforward! 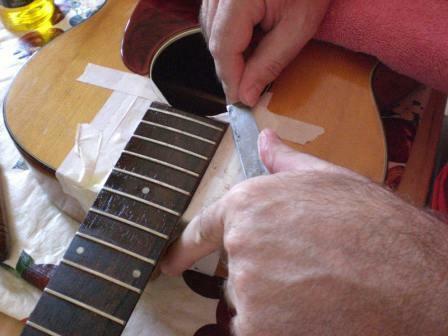 I have steamed off necks, but was looking for a cheap ,easy, everyman fix to get 'cheap' guitars up & running. I mean ya could do this with a paint scraper and a hacksaw blade. Like I said in the first post... minimal expertise, expense... etc. 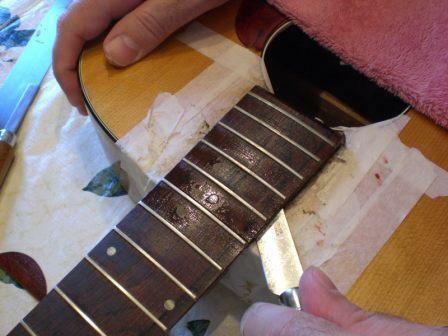 All kidding aside, if a 'real' repair guy hit ya up for more than 75-100 bucks to do this, he oughta be whacked with the guitar instead of being given the opportunity to fix it. lol ! Bottom line though guys, kamakaze...well sure it is...but it's back from the land of the unplayable and it was pretty easy to do. 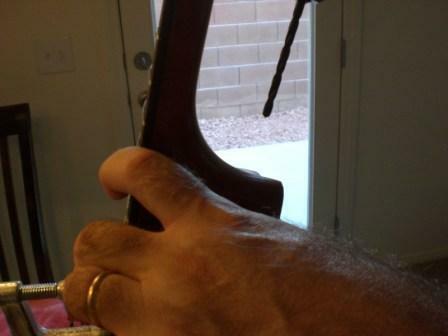 You'd never suspect it from looking at it & prolly just think the bolt was for a loose neck joint. In the right context it could be a viable option for some guitars. 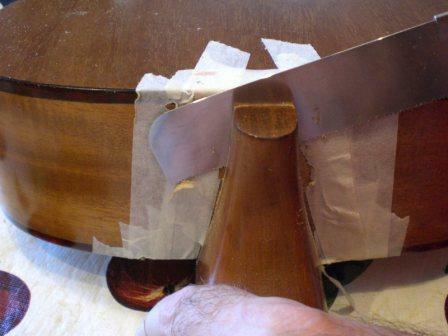 Obviusly not something ya want to do to your vintage d-18.